LinkedIn has proven itself to be a powerhouse for over 500 million professionals looking to network and uncover new career opportunities. The platform has also a hub of activity for marketers looking to land talent, build authority and signal themselves as the go-to pro within their niches. For marketers looking to take full advantage of what LinkedIn has to offer, they should look at LinkedIn advertising not as a matter of “when” or “if,” but rather understand “how” to go about it. 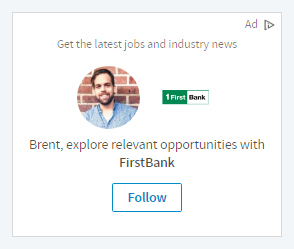 After all, advertising on LinkedIn is definitely a different beast from the likes of Facebook. LinkedIn offers marketers a variety of options to put themselves out there, each with their own unique best practices. In this Linked ads guide, we provide a quick yet comprehensive overview of what the platform has to offer marketers. Whether you’re totally new to LinkedIn or want to beef up your current marketing presence, these tips and strategies can help you craft an effective campaign. 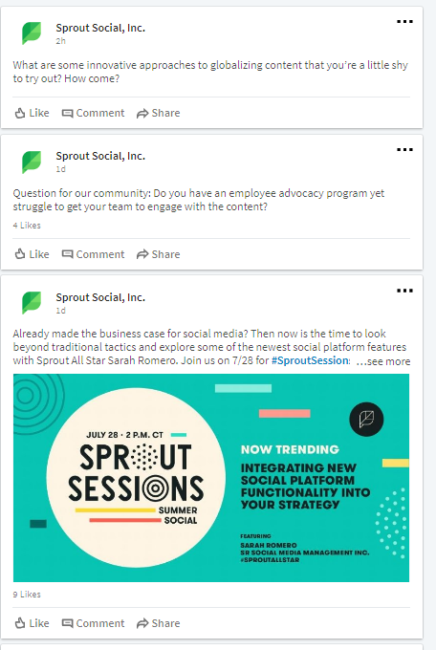 Once you've started leveraging LinkedIn for your social media efforts, leverage Sprout Social to get insights on your efforts. First thing’s first: before making your way through our LinkedIn ads guide, it’s definitely in your best interest to create a Company page. Think of your Company page as your own personal hub, representing yet another point to amass new followers and share your content. Don’t worry about the size of your team: granted you aren’t flying solo, company pages are totally fair game. You must set up a personal profile with your actual first and last name. You must have several connections on your profile. You’re a current company employee and your position is listed in the “Experience” section on your profile. You have a company email address added and confirmed on your LinkedIn account. Your company’s email domain is unique to the company. Thankfully, meeting these requirements should be easy for those who understand LinkedIn’s best practices and already have a presence on the platform. Even if you’re totally new, building out your profile to the point of permission for a Company page shouldn’t take more than a week or so. Beyond your Company page, Showcase pages can be used to showcase specific products, services or initiatives of your business. While this feature is leveraged mostly by bigger brands such as Adobe and Amazon, Showcase pages are a great feature for businesses offering multiple solutions for their followers. Choose which aspect of your business or which product deserves a Showcase Page. Bear in mind that you shouldn’t use Showcase pages as an excuse to spread yourself thin. If you have a particular product or service that deserves its own page (think: a specialized software or new launch), go for it. 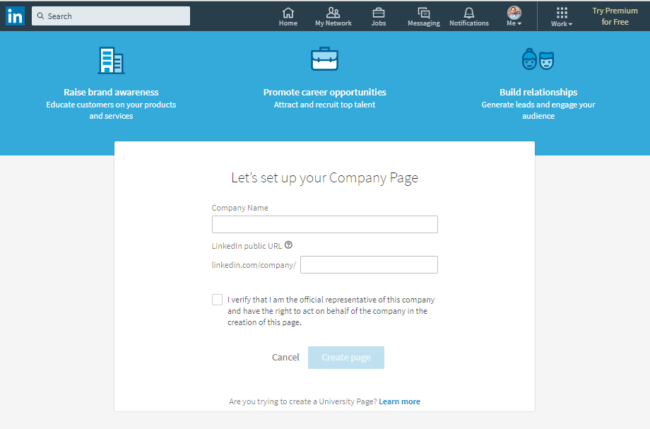 Company and Showcase pages are essentially the foundation for advertising on LinkedIn. Next, we’ll delve into the actual LinkedIn advertising platform. LinkedIn stresses cost-effectiveness through its self-service ad platform. In fact, you can target a specific audience for as little as $10 per day. The criteria for LinkedIn’s self-service ad platform includes the ability to segment ads by company, job title, job function, seniority, school, skills, age, gender and more. Not unlike Facebook Ads, LinkedIn allows marketers to drill down and reach only specific users versus casting the widest net possible. Additionally, LinkedIn provides advertisers a wealth of options to reach their target audience. Granted your account and Company pages are set up, below is a snapshot of what you can do. PPC ads on LinkedIn are perhaps the easiest to get started with. These ads have the potential to appear in multiple places such as within a user’s inbox or on the side or bottom of the LinkedIn homepage. Self-service display ads give you the ability to include an image or video, as well as ad copy. If you really want your advertisement to get clicks, it’s crucial to include some sort of image alongside your ad copy. 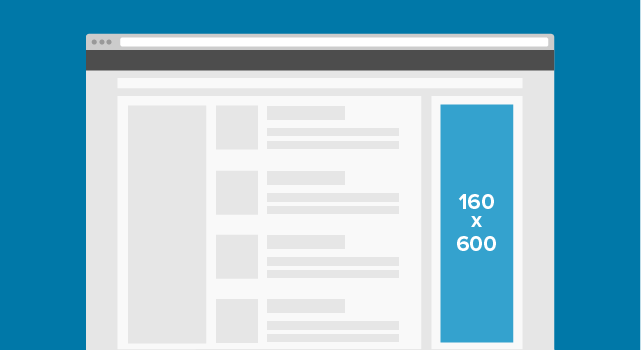 According to LinkedIn’s guidelines, ads with images are said to drive 20% more clicks. 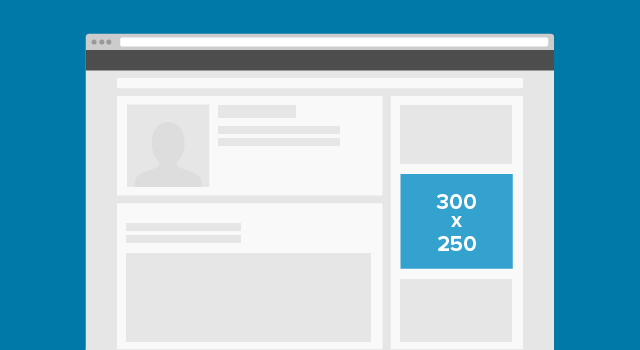 The dimensions of your accompanying image should be a square with a maximum size of 50 by 50 pixels. Generally speaking, companies use images of people, their product or company logo. Your ad headline has 25 characters to make an impression on your audience, so you obviously need to make each word pack a punch. Perhaps the best way to make this happen is to cater your copy to the specific audience you’re targeting. Additionally, posing a question to your audience to pique their curiosity is always a solid idea. 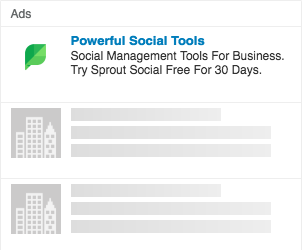 The beauty of LinkedIn ads is two-fold. For starters, they aren’t as “in-your-face” and tend to flow naturally within any given page. Secondly, they force marketers to get creative rather than try to push the same old spammy ad that you’ve seen a million times before. Now, once you’ve come up with a headline, it’s time to drive the point home with your body copy. You have 75 characters to fit in a brief description of what it is you’re offering and ideally you can also squeeze in a call-to-action. The next section of our LinkedIn ads guide delves into one of the platform’s greatest strengths for marketers: sponsored content. 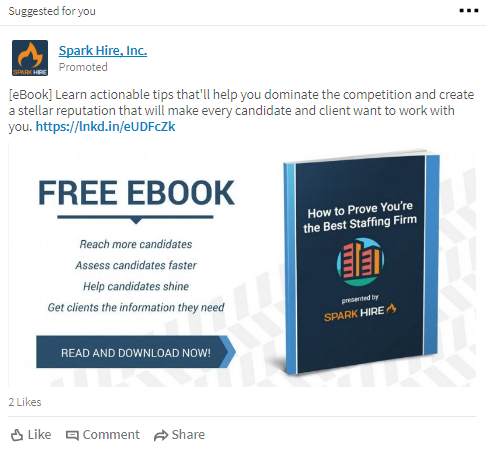 While others ads on LinkedIn show up on the sidebar or at the tops of pages, sponsored content appears smack dab in the middle of your audience’s news feed. Such placement naturally leads to more engagement. Sponsored content represents prime real estate for marketers, especially those who understand the principles of content marketing. 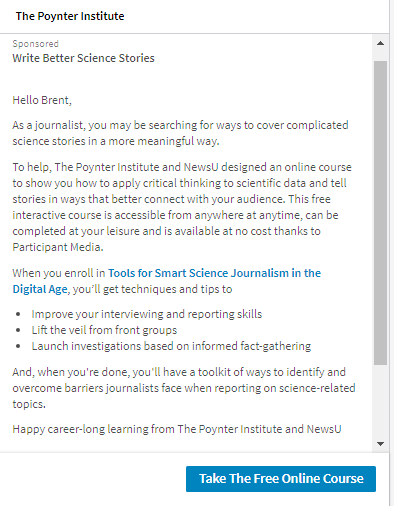 Paying to show off your latest article or update is a brilliant tactic for companies that run frequent case studies or have some awesome slice of knowledge (think: a lead magnet) they can use to reel in clicks. You need access to a Company page if you’re going to sponsor content. Navigate your way to the advertising platform, click the “Create new campaign” button, and choose “Sponsor Content.” Now you can pick out the update or updates that your company has created that you want to distribute to a wider audience. Choose the audience to which you want to distribute that content. It’s important to note that not all content is created equal. A post that’s relevant to one group might not be relevant to another. Remember that you’re able to segment your ads by location, company, industry, title, skills, degree of study and more. Pick out a bid for your sponsored content. Bids will run on either a CPC or CPM basis, and it’s important to test and optimize which option drives the best cost per lead/conversion for your company. LinkedIn will recommend a bid range, but often it’s necessary to go over that amount to guarantee your ad is spending its entire budget. 74% of B2B buyers ultimately choose to work with companies that are the first to provide them with useful content. Content via LinkedIn gets 15x the interactions versus job postings in users’ feeds. 7 out of 10 professionals describe LinkedIn as a “trustworthy” source of professional content. In the final section of our LinkedIn ads guide, we’ll delve into the specifications of the platform’s diverse display ads. These display ads boast the same targeting features as the self-serve ads. However, they differ in both the placement and size of the ads that you’re able to serve your audience. There are four different display ad formats available for marketers. 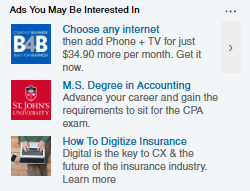 All of these dimensions are courtesy of LinkedIn itself. This is the display ad that appears above the fold on the righthand side of pages. The Medium Rectangle ad appears on the home, profile, company, and group pages. This is the tall ad that appears on a user’s inbox and message pages. This option doesn’t include an image. It’s a line of text that appears on the home, profile, company, group, and message pages. This landscape style image appears at the bottom of certain feeds, making it one of the last things users see before leaving the site. These display ads give marketers a lot more freedom to be creative than the self-serve ads. Furthermore, LinkedIn boasts a programmatic buying platform for their ads which they claim offers more control and better targeting for advertisers. LinkedIn recently made Sponsored InMail available to all marketers, offering a chance to reach your audience with a more personal touch minus a stingy character limit. Simply put, Sponsored InMail provides advertisers the ability to send a form or an email message to any of LinkedIn’s 500 million users. The InMail feature also uses LinkedIn’s segmenting features to choose a highly targeted group of users to send your message to. InMail definitely presents unique opportunities to advertisers looking to present themselves as a helping hand. Fortunately for advertisers, LinkedIn has imposed a limit on the number of sponsored InMails that a user can receive in a certain time period. This guarantees that your messages won’t get lost in all of the noise. Each user is only able to receive one InMail within a 60-day period. If you’re just starting out as a company on LinkedIn, growing your followers is an absolute must. 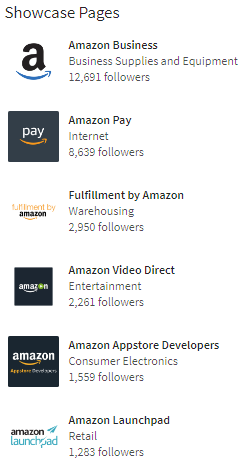 These are ads that appear on a user’s page in order to encourage them to follow your company. Not only do these ads boost your credibility on the network, but once you convert users into followers you can essentially promote your content to them for free. As you can see, LinkedIn offers plenty for brands to work with through their robust ad platforms. From promoting your company and products to industry groups and killer content, it truly is a matter of “how” when it comes to LinkedIn. Additionally, LinkedIn provides brands awesome analytics and conversion tracking to ensure that advertisers are getting the most bang for their buck. Hopefully our LinkedIn ads guide was helpful! What else would you like to see LinkedIn’s ad platform roll out in the future? If you’ve been on the fence about LinkedIn ads, what’s holding you back? Let us know in the comments below!